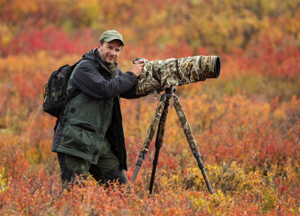 In today’s post, wildlife photographer Stan Tekiela describes his work as a naturalist. Find out more about his important educational work. himself a naturalist. Charles Darwin, David Attenborough, and John J. Audubon are some other notable naturalists. So the what the heck is up with the interpretive part? Interpreting or translating the technical and scientific natural world into something understandable for the average person is what a naturalist does. But I also believe this is where we get into major trouble. We as humans are wonderful at internalizing things and making them our own. It isn’t surprising that we interpret the natural world using our own ideas, thoughts, and emotions, but this is where we ultimately get it wrong. You see, we people think that whatever we see, hear, smell, and, worse yet, whatever we feel emotionally is exactly what birds and animals see, hear, smell, and feel. We couldn’t be more wrong. You cannot go out and see a bird or animal doing some behavior in nature and, based on all of your human tendencies, interpret what it is doing. You need a background and knowledge based on animal behavior studies to help you correctly interpret what you are seeing. You also need to remove your own personal feelings, judgement, emotions, and bias before you can correctly understand what is going on in the natural world. Here is an example of how we get it wrong. In just the past 20 years, we have learned that birds have the ability to see in the ultra-violet light spectrum. We as people can see seven colors of light. These are represented in the acronym ROY-G-BIV. This stands for the seven colors of light we can see: red, orange, yellow, green, blue, indigo, and violet. While we can see seven separate colors, our eyes have only three color receptors. We have receptors to see red, green, and blue only. All of the other colors are variations of the three main colors. Birds have four color receptors in their eyes. They can see red, green, and blue but also ultraviolet. That’s right, birds can see things we can’t see. How can we possibly interpret something we can’t see or experience? 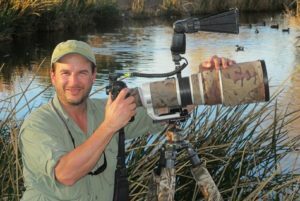 At first we were perplexed as to why birds have the ability to see in the ultralight spectrum. Experiments have revealed that some birds, such as hummingbirds, use this ability to see in UV light to find nectar in flowers. Flowers have something called nectar guides, which are dark lines on the flower petals that point to the nectar within. Insects see only in UV light, and this is how flowers attract insects. You and I can’t see them, but the insects and birds can. Just this past week, a news report out of England announced that the large bill of the Atlantic Puffin, a funny looking sea bird, shines like a freshly cracked glow stick when viewed under UV light. 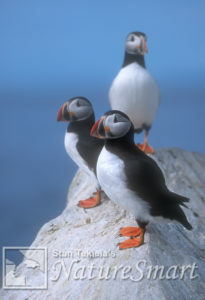 The two yellow ridges on the puffin’s bill, called the lamella and cere, shine very brightly under UV light. While it is impossible to say just how the birds see or use this information, it is just one more example of things going on in nature that we couldn’t possibly know. So how can we be accurately interpreting what we are seeing?